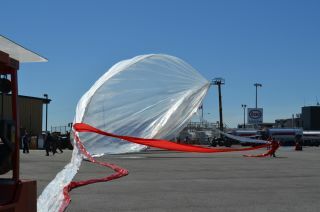 Canadian Space Agency officials unfold a high-altitude balloon for recovery operation drills in Timmins, Ontario. The space agency hopes to start launching science balloon missions into Earth's atmosphere by 2014. In Timmins, Ontario, a city most famous for its museum devoted to country singer Shania Twain, the Canadian Space Agency is hoping to attract visitors of a different sort. The space agency is helming an effort to launch unmanned weather balloons from Timmins' airport. If all goes well, the city of 43,000 may become the go-to destination in 2014 for Canadian researchers looking to send experiments soaring into the upper atmosphere. This week the CSA has been performing a series of simulated "recovery operations" to test gear and methods for retrieving a science balloon once it finishes its flight. CSA officials, in partnership with the city of Timmins, the French space policymaking agency CNES and regulatory authorities, also will review the progress in building a launch pad ― construction began this summer ― and will chart plans for the first test flights in early 2013. Already the CSA is fielding requests from researchers wanting to fly payloads when full operations begin in 2014. The University of Toronto is in early talks to put a 2,200-pound (1,000 kilograms) telescope on a weather balloon, said Daniel Lévesque, the CSA's project manager for the balloon science program. As with any good market opportunity, the Timmins faces competition in attracting researchers. The balloon launch facility will be a new entry among an international field of weather balloon launching groups, many that have been around for decades. CNES, which has 40 years of experience flying weather balloons, is assisting with the setup to help the CSA with the learning curve. The challenge will be keeping costs affordable, to keep it competitive against North American entities such as NASA's Suborbital Ballooning Program. The first customers are likely to be from Canada. Lévesque said the agency is looking for researchers from anywhere, from universities to private industry. But even within Canada, there's a prominent suborbital science group that's been in the field for decades. The company Bristol, a subsidiary of Magellan Aerospace, just celebrated its 50th anniversary of launching Black Brant rockets. After more than 1,000 launches, Bristol boasts an extraordinary 98 percent success rate. Researchers can send up payloads ranging from 154 to 1,873 pounds (70 to 850 kg) during a rocket flight and gain anywhere from eight to 20 minutes of research time. Although none of its launch sites are in Canada, Bristol is a natural entry point for Canadian researchers seeking cheap access to space. But Bristol's Dave O'Connor downplayed the idea of competition from CSA balloon launches, saying that, if anything, they could help his firm's business. "We are in favor of the CSA supporting small-scale science experiments," O'Connor said in an email. "The scientists who do balloon work often evolve to doing larger projects on rockets or small satellites, so that is a potential benefit to us in the long term." Lévesque also saw plenty of room for both types of research flights. "We're more complementary than competitive to rocket launches," he said, explaining that researchers on the latter type of flights usually want to study microgravity applications. As a counterpoint to brief rocket flights, the CSA aims to time the launch of its balloons for when the winds will carry them as long as 10 hours. In Timmins, these winds tend to occur around May and August-September. The CSA hopes to fly up to 12 payloads per balloon, depending on its size. The largest balloons will heft 3,300 pounds (1.5 metric tonnes) of equipment and cost $150,000 to $200,000 per launch. Smaller ones, perhaps flying a few pounds of payload, would probably cost in the tens of thousands of dollars, Lévesque said. The balloons would fill an important niche in researching the area between 12.2 miles and 25 miles (20 to 40 kilometers) above the Earth, he said. One potential science application could be to study ozone formation, since that is the altitude range in which those molecules congregate. Follow Elizabeth Howell @howellspace and SPACE.com @Spacedotcom. We're also on Facebook and Google+.